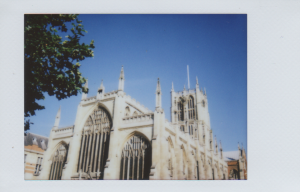 The building of Hull’s Holy Trinity Church commenced round about 1300, it was halted during the Black Death, and was completed in the early 15th century; it’s the oldest brick building still standing in the British Isles that serves its original purpose; it was defaced by mobs during the Reformation, housed the city’s fire engine, and — if rumour is to be believed — was once partitioned as a result of those eminent figures in Hull who refused to submit to the Puritan Commonwealth. There are few buildings that remain standing in Hull that are as synonymous with the city and its history as Holy Trinity Church. When you then take into account HTC’s physical space, acoustic properties, carillon and organ, it’s easy to see why I have chosen it as the venue to host the premiere of Bethia in 2017. Bethia commemorates 2017 and the maritime heritage of Hull through a reading of The North Ship by Philip Larkin, which is set to music and enhanced with projected motion-picture of Hull, taken from the archives of the British Film Institute and the Yorkshire Film Archive. While the language of both the poem and motion picture pertain to the sea, the music will use instrumentation to do so, by using HTC’s carillon and a small sea shanty chorus. Carillons have their own maritime heritage, which dates back to the early Byzantium and Christian churches (the carillon being a gradual development of the cymbala), but also to the Crusades and the explosion of knowledge pertaining to percussive instruments that occurred upon contact between Europeans and the Middle East. From the thirteenth century onwards, bells were used onboard vessels to mark the passage of time (struck every half-hour) and to announce a vessel’s presence in poor visibility. The carillon at HTC is quite remarkable: it’s a fully-working set of bells across two octaves (C4-C6; C#4 and D#4 awaiting installation at the time of writing), which has had MIDI-controlled motors attached to its hammers. By using a basic MIDI keyboard and corresponding MIDI or LAN connection, one can control the carillon bells of HTC — a sound long-associated with the city — from the comfort of a piano stool. As Bethia is due to receive a second performance at London’s Royal Festival Hall, I’m developing a means to record the sound of the HTC carillon as a 5.1-surround sample instrument, which would allow a realistic and responsive digital version of the bells to be taken to any venue on a laptop or sampler keyboard. There will be much more coverage of this process once recording has begun later in the year. The grand organ at HTC is a different story and needs a significant amount of restoration if it is to be used in performance or embraced by composers and creators of new music. It is an organ almost the same size as the organ of Westminster Abbey and is, in fact, much older. I’ll be writing more about the grand organ next week, but if, in the meantime, you wish to know more about it, then please get in contact with HTC’s director of music Mark Keith.